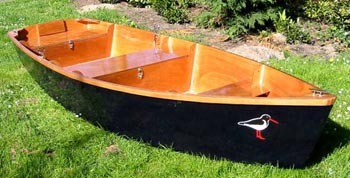 The Flat Skiff 12 is probably the easiest boat to build in the whole website and it's not the smallest one. She is designed for rowing and small outboards. New in 2015: available as a downloadable plan with full size patterns. Scroll down to see the kits available for this boat. The skiff boat plans for the Flat Skiff 12 package includes dimensions in inches and metric. This plans package is available as an Instant Digital Download or in a printed version. More information There will be a download link on our thank you page. If you need to re-download the plans, you will also receive a link in the confirmation of your order, accessible for five days. If you need access to the file after that time, please contact us, and we will send you the plans by e-mail. Click this link for further info. on digital downloads and printed plans.